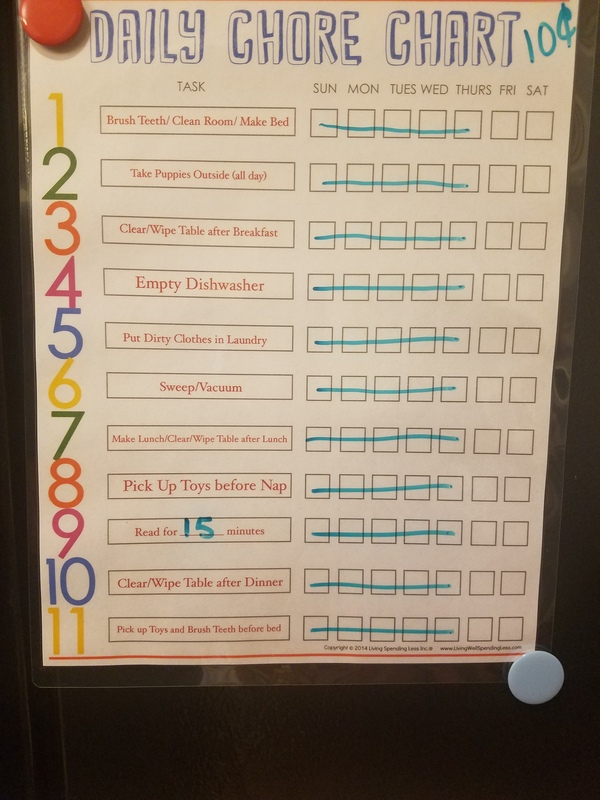 We decided to implement a chore chart for our 8 year old. He has been responsible for cleaning up and has earned electronics for doing so. But, we want to give him more responsibility and allow him to not only earn electronics, but earn an allowance at the end of the week. I googled online and came across the following website that gave me the template for FREE!! I edited the document, printed and laminated it that way we can write and erase with dry erase markers, and use the same sheet every week. Ethan (my 8 year old son) seems really excited about his chore chart and earning money to buy ice cream (we buy this for them no matter what) and video games. He really wants the new Cars 3 game for his Playstation 4. We went over the rules, and he will need to come and let me know when he has completed a chore, I will then go and inspect, then he can mark it off for that day when i have approved of it. He also cannot touch an electronic until chore numbers 1-6 are completed for the day. I will update on the progress of how Ethan keeps up with his chores, and then I will eventually make one for my 5 and 4 year old girls.